I stayed in the Hotel Heliot during my stay in Toulouse. It’s conveniently located close to the train station and city center. The Capitole is the city hall of Toulouse. It was originally built in the 12th century but looks completely different today. The building you see today is of Neoclassical architectural style. It’s famous for its 8 columns and pink facade. Each column represents one of Toulouse’s 8 districts (capitoulats). 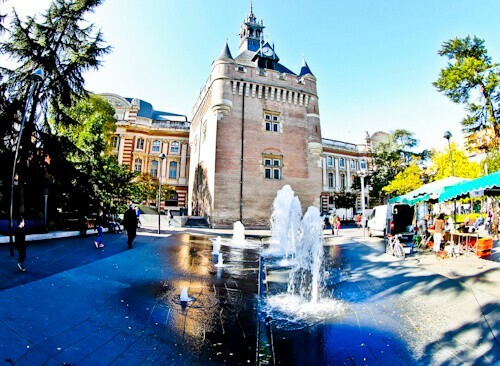 Toulouse is known as the pink city. In front of the Capitole building is Capitole square. Around this square you’ll see lots of pedestrianized streets. On the square and these streets you’ll find lots of shops and restaurants. A good time to photograph the Capitole is after rain. I photographed it after they washed the square late at night. You’ll get a good reflection shot. At the rear of the Capitole you’ll find the Donjon du Capitole. The Donjon is known in English as the Archive Tower. It is the oldest surviving structure of the original Capitole and dates back to the 16th century. Today this building houses the Toulouse tourist information office. If you are traveling to Toulouse with kids they will love the water fountains. There was a martyr in Toulouse called Saint Sernin. Saint Sernin refused to worship the local gods. As punishment he was dragged by a Bull from the Capitole until he became detached at where the Notre Dame stands today. Of course he was killed whilst being dragged all this way over stone steps. The Notre Dame is built on this spot in his honor. The street is now called Rue du Taur (bull street). It’s a pedestrianized street full of cozy cafes. 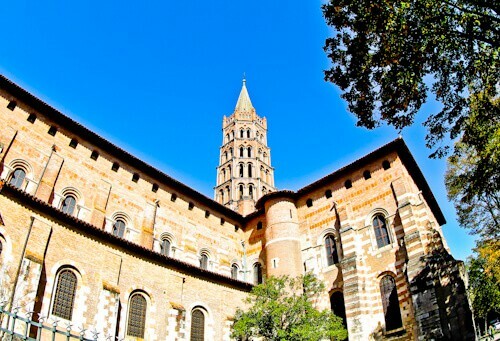 At the end of Rue de Taur is the Basilica of Saint Sernin. This is the only UNESCO site in the city so a must see. You can see the spire from most parts of the city. It is the largest Romanesque building in the world. Inside the basilica is a Baroque sarcophagus with the remains of the saint. This basilica is a major part of the Santiago de Compostela route to Spain. You may see pilgrims here with a long walk ahead of them. 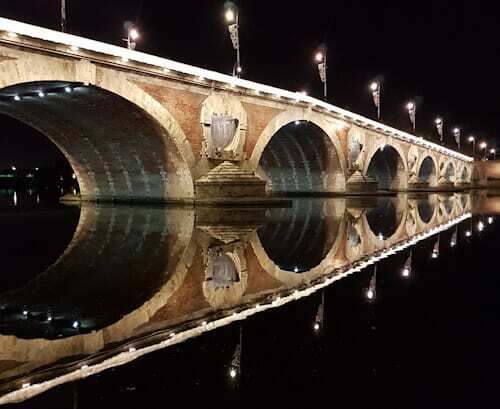 Pont Neuf crosses the river Garonne and is known in English as New Bridge. Construction of the bridge began in the 16th century. It took over 100 years to complete. The arches of the bridge are not even. They were originally designed to look like a lion but this never happened. During both the day and night you can take perfect reflection photographs of the bridge. Just to let you know how perfect the reflection is, the above shot was taken with my phone. Alongside Pont Neuf is the Notre-Dame de la Daurade. This Notre Dame dates back to the 5th century. In the 15th century a black Madonna was housed here. The black Madonna was stolen and its replacement was burned by French revolutionaries. The black Madonna you see there today is a 19th century copy of the original. The original Pont Saint Pierre was a suspension bridge built in the mid 19th century. It was recently completely destroyed and rebuilt. Like the Pont Neuf alongside it, it crosses the Garonne river. During the day and night you can make perfect reflection shots here. 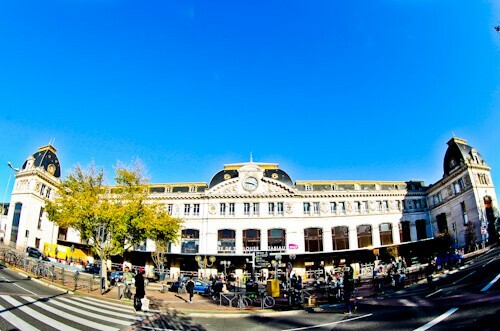 Toulouse-Matabiau is the name of Toulouse train station. The train station is a point of interest of the city by itself. It was designed by French architect Marius Toudoire. He also designed the train station in Bordeaux and you can see similarities. In 1864, the first canopy of the train station was created by the company of Gustave Eiffel. The bus station is located alongside the Toulouse-Matabiau train station. Like in Bordeaux you’ll be leaving from close to a Gustave Eiffel related structure. 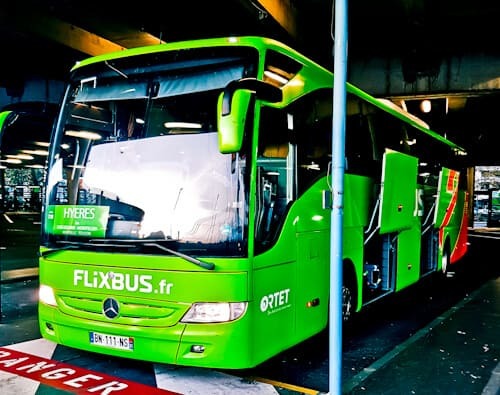 The Flixbus to Marseille takes 6 hours. It stops at Montpellier on the way in case you want to visit this city too. As always you get free WiFi and power to charge your phone / tablet. I’ve yet to visit Toulouse, so this was a great read for me. What a tragic story about the guy being dragged by a bull and street being named after the bull! I like that you always give photography tips! I’ll try my best to capture the Capitole after the rain when I do eventually get to Toulouse! I’ve only ever been to Paris but I’m dying to visit more of France! Great tips on how to get around by bus, and tips about the city too. Photography spots is a great idea! Beautiful photos! I didn’t realize Toulouse had a UNESCO site. The city seems to be full of beautiful buildings. I hope to get there and see them all one day! Toulouse in pictures is beautiful. Notre Dame du Taur is a beautiful building too notwithstanding the ugly story. I wonder how Pont Neuf would have looked like if it had the shape of lion. So much to see in Toulouse. I’d love a visit and you’ve always got the best shot. I love how beautiful the city looks at night! Especially when the lights are on at Capitole. I can’t wait to visit Southern France next time! 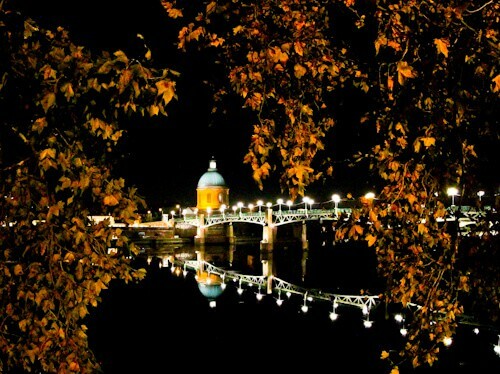 Toulouse looks like a very picturesque place, my partner would be in heaven with his camera. The Capitole looks like a great building to photograph. We’ve only been to Paris but it would be great to see some more of France. Great photos as usual! The Fisheye effect does help a lot for some places! Pont neuf is beautiful and so is Pont Saint Pierre. Can’t wait to spend some more time in France to visit! 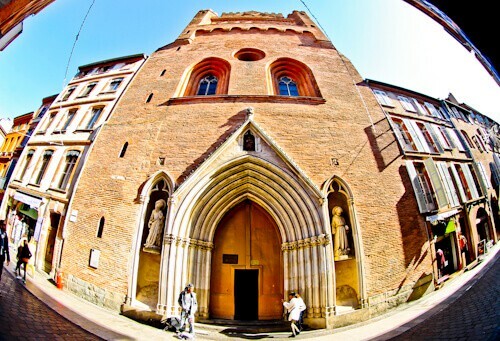 I didn’t know anything about Toulouse before reading this, or even where it was! It looks like such a romantic city, a walk by the river with all those reflections with my partner would be amazing. The train station and connection with Gustave Eiffel is interesting too, he is a French national treasure. 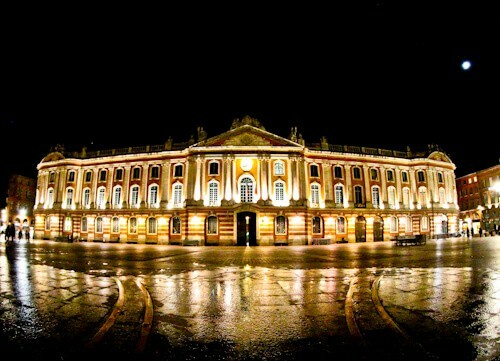 Toulouse looks amazing, I can’t believe I’ve not seen any pictures of it on Instagram before. It would be interesting if you were to see some pilgrims there starting their walk to Santiago de Compostela. Because you included the map I checked out how far it would be – there are many days of walking! I’ve never been to France, which is ridiculous considering I can actually drive there! I’m based in UK 🙂 Toulouse looks very pretty! But would probably need to brush up on my French before i attempted going there! It’s been more than 10 years since I’ve been to Toulouse… reading your post really makes me want to revisit the city 🙂 I don’t remember that much from back then though – but the Basilica de St. Sernin sure left an impression. As for travelling with Flixbus: Signing up for their newsletter is great: Sometimes they have some 50% off deals! This is a lovely route and great for architectural photography. I was in south France last summer and it is indeed very easy to use public transport to visit from one city to another. I love bus travel in Europe! Riding in a bus makes us see the countries up close. 🙂 The architecture of Toulouse is really cool; they were able to preserve the classical look and atmosphere. 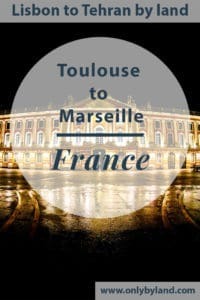 Interestingly Toulouse was one of the places I had shortlisted for my Europe trip but I could not manage it owing to time constraints. I see how much I missed. Every place here is so beautiful. I particularly found myself intrigued by Notre Dame du Taur – I suppose the whole legend associated with it is what makes me curious. Well captured through pics and words. I was just looking at what to do in Toulouse as I’m going to pass through on the Camino de Santiago. I will pass over to the bridges at night as it looks spectacular. The bridges with reflection look amazing at night. I would love to see it for myself, Toulouse looks just as romantic as Paris, I must visit more of France. The 2 bridge shots are perfect, not a breath of wind or a duck in sight. That poor man being dragged by the bull. There were some seriously barbaric ways to punish people for having different ideas in the day. Love the Toulouse architecture. Love the bridge pictures. All of the architecture is gorgeous at night. What an interesting/tragic story about the man being dragged by the bull! Yikes! I really need to explore more of France and Toulouse looks beautiful, just like most of the country! Plenty to see and do – I love your city guides! Look forward to the continuation of the adventure! I have to say James that you have made a beautiful city come to life and look even more beautiful, stunning photos and perspective. You have really showed that Toulouse needs to be visited, pinned!